A small crowd gathered near the trash and recycle bins of a pale yellow home on the corner of Whitney and Fern. Saturday at high noon is traditionally the time of reckoning for properties subject to foreclosure auctions, and the appointed hour grew near. The group that was forming was an eclectic bunch. Investors walked with purpose as they evaluated the outside of the property, measuring the opportunity. They paced back and forth on the sidewalk, consulting via phone with business partners, contractors and any other experts they trusted to get a solid sense of what the building was worth to them. Neighbors wandered in and out of the scene, at a more leisurely pace, trying to learn about a difficult situation that they had been monitoring for months. Those who wanted to take a look inside waited at an entrance for a guided tour one at a time. As the auction approached, it appeared that there were about fifteen groups in attendance. The focus of everyone’s attention was a multi-family home a couple blocks from the UConn Law School. It was surrounded by more multi-family than single-family structures, but the immediate vicinity is a nice mixture of both residential uses. This particular building is currently configured as three apartments, with one on each level. As a corner lot, it has two sides facing a street, and is actually numbered with two separate addresses. There is a detached two car garage and a generous parking area that is a mix of pavement, former pavement and grass. Despite the poor presentation, the home had many positives. The interior unit that we were able to tour was spacious and in good condition. We were told that the other main unit had a similar layout. The home had natural woodwork and high ceilings. Buildings from the early 1900s were well built, and the quality craftsmanship was still visible throughout the property. The auctioneer called the proceedings to order and explained how the auction would be run. Nine bidders had formally registered and were issued bidder identification numbers. The bank holding the mortgage started things off with an opening bid of less than $175,000. It seemed very likely that someone would offer more than that. Bidding started slowly. The auctioneer always started by asking for $5,000 increases over the previous high. If nobody offered, he then opened it up to bids in any amount. The high offer rose in an erratic manner; $1,000 at a time for the most part, but with smaller increments mixed in and the occasional $5,000 jump. Four bidders were involved in the action early on, but as the price rose over the $200,000 mark it became a back and forth between two bidders. While the auction was taking place, all eyes were on the action. Drivers passing by in the street stopped in the driving lane and leaned out their window to hear what was going on. The owner who was having the property taken away from him arrived midway through the auction and sat in his car in the driveway taking in the scene. The current tenants, reluctant participants in the entire spectacle, watched the proceedings together from one of the porches. Not only did they have to deal with the auction and accompanying events, but they also were not sure whether they would be allowed to stay in their apartments after the sale since they were renting on a month-to-month basis. One had been researching tenant rights and believed that they would either get to stay as tenants for the new owner, or be offered an incentive to leave in compliance with the State’s “Cash for Keys” program. 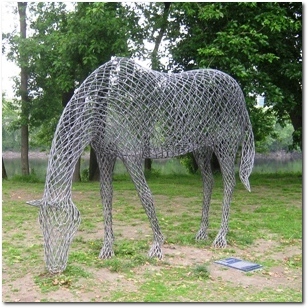 The challenge was the uncertainty of it all, waiting to learn the new owner’s intentions for the property. When auctioneer finally yelled “Sold!,” the high bid stood at $230,000. The winner seemed pleased with the purchase and joined the auctioneer up front to hand over a bank check for the deposit and finalize the paperwork. The sign posted on the property announcing the auction stated that the balance of the funds must be paid within 30 days of the sale being approved by the bankruptcy court. Just like that, a new owner was in line to take over the home. Sadly, this building is not the only one in distress in the neighborhood. They are sold in different ways, some more visible than others. Hopefully each will end up in the hands of new owners who will become contributing members of the West End community. Haas Institute: Hartford Most Underwater in USA? Yesterday a study originating from the Haas Institute for a Fair and Inclusive Society at the University of California, Berkeley began making the rounds through the media. Here is the full document. 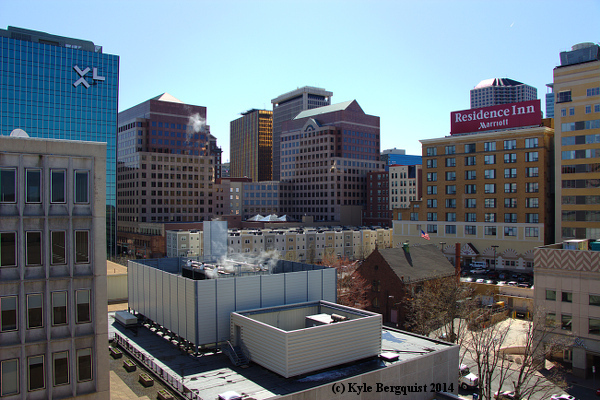 The report identified Hartford, CT as the city with the “Highest Incidence of Negative Equity” in the entire country. They found that 56% of Hartford homes are underwater, meaning that the owner owes more on their mortgage than the home is worth in the open market. The table of the top 100 cities can be found on page 23 in the report. Although there are certainly underwater property owners in the City, and related financial distress, the methodology used in the study is very likely flawed – overstating the problem in Hartford. Page 37 of the Haas Institute report notes that the negative equity analysis used for the rankings comes from Zillow, with the authors referring the reader to this page on Zillow. My understanding of the process is that Zillow used their “Zestimates” and as the current value of a home, and data from TransUnion for mortgage amounts. The Hass Institute study authors then used the resulting negative equity Zillow calculated as the primary variable to sort the country’s cities and metro regions. Zillow Zestimates have been consistently inaccurate in the City of Hartford. We have written about this before, here and here, with a representative from Zillow even engaging in the discussion. There has been no resolution – Zillow values continue to be well below what buyers are willing to pay for non-distressed homes. Our theory is that Hartford’s split assessment ratio is mucking up the Zestimates. Residential properties in the City are assessed at about 30% of market value instead of the 70% that all the other towns/cities in the state use. We will send this along to the authors of the study and encourage them to do their own research into the potential data problem. 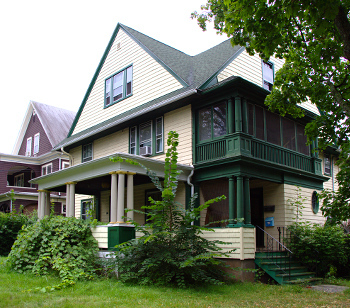 The methodology seems flawed when considering housing in the City of Hartford. The questionable conclusion that they reached, which has been trumpeted by the local and national press, reflects poorly on the city in a way that’s not really fair. Ideally we would like to see the authors edit the report if they reach the same conclusion that we do. Author KylePosted on May 9, 2014 Categories Hartford, Market StatisticsTags Berkeley, distress, Haas Institute, Hartford, Underwater2 Comments on Haas Institute: Hartford Most Underwater in USA? Our local MLS added two fields to denote distressed sales back in 2008. As with most new things, the fields were not immediately and uniformly adopted by the thousands of individual agents in the area. Now that they are widely used, we can begin to look at the level of distress in our local markets using the CTMLS database. At the big picture level, it appears that distressed single-family homes and condominiums sales represented about the same percentage of total deals in 2011 – approximately 1 in 7. Multi-family sales were much more likely to be distressed – nearly 1 in 2. 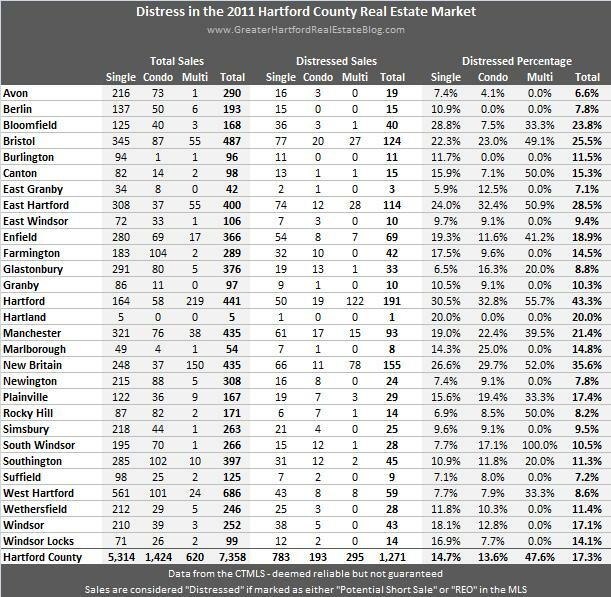 The percentage of distressed sales was highest across all property types in the more urban towns of Hartford, New Britain, East Hartford and Bristol. Their total percentage of distressed sales was inflated because those are the towns with the most multi-family properties, but in general those towns had the highest levels of single-family and condominium distress too. Bloomfield had the second highest percentage of single-family distress, but a below average percentage of condominium distress and very few multi-family sales during the year. Although this chart incorporates a lot of information, it only scratches the surface. We’re excited to have all this data available and will continue to look for other interesting questions that it may be able to address. We spend a lot of time talking about single-family homes and condominiums, but multi-family properties are another important part of the local housing scene. Where are the the multi-families in Hartford County? As you can see by the number of contracts written on this type of property over the past two years, they are concentrated in just a few towns. 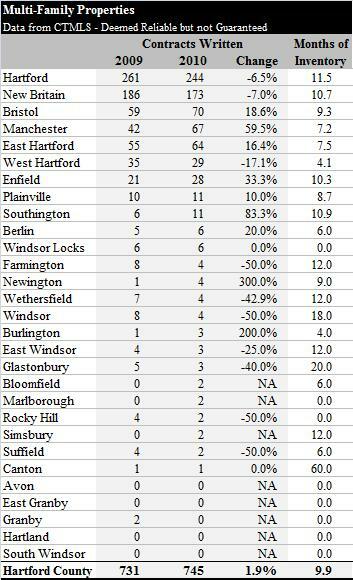 Lots in Hartford and New Britain, and a solid number in Bristol, Manchester, and East Hartford. Beyond that you have to really keep a close eye on the market or the opportunities will sneak past. The overall number of contracts in 2010 was actually up slightly versus 2009, which is a big difference from what we saw in the single-family and condo markets. Even more interesting, there was a slight decrease in activity in the two biggest markets, but nearly all the other towns added just a couple deals and made up the difference. Inventory is on the high side for the towns with lots of multi-family housing stock. This is partially related to the higher rate of financial distress than with other types of properties. Many investor-owners felt the pain of the housing crisis first (uh oh, prices aren’t going to continue rising) and gave up their multis early in the game – sometimes it was voluntary, other times not. Either way, the distressed sales have increased the available inventory and pushed prices down for everyone, even quality properties. Our main observation is that even with the bloated inventory, the best multi-families sell quickly. There are financially strong investors out there looking to add to their portfolios, and the cap rates are much more attractive now that prices have fallen. Buyers on the hunt for a top-quality multi need to (1) have their financing in order, (2) have an automatic MLS search set up to get the new listings ASAP, (3) have a flexible enough schedule that they can visit the home the first day or two, and (4) be comfortable making quick evaluations/decisions. The good stuff sells very quickly if it is priced right.